jennie's nails and tales: I'm Still A Wiener! 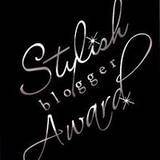 Julie, over at downtime has awarded me with the Stylish Blogger Award!! So, I need to share SEVEN things about myself. Since I've won this award once before, I'll try to think up some interesting didn't-make-the-top-seven facts. All right, here goes. 1. When I was about four years old, I decided that I didn't want a younger brother anymore so I did what any four year old girl would do...I put my little brother (aged two) in our empty bathtub, locked the bathroom door from the inside and went outside to play (I left him with a toy or two, I wasn't totally cruel). My mother wasn't as impressed with my plan and the fire department had to be called to break the door down. The reprimand from the VERY LARGE fireman haunted me for years. 2. It's impossible for me to believe that Anne Hathaway is anyone other than herself when she's in a movie. It's frustrating because she's in a lot of movies that I WANT to like, but find myself saying, "Why would Anne Hathaway do that?" and it breaks the mood. 4. I suffer from a not-so-mild Diet Coke addiction but feel justified because I don't drink coffee. 5. I've currently completed "Week 1" of a 13 week running program called "Couch to 10k." Although I vowed to only run if being chased by bears (after completing a half-marathon that nearly killed me - my cross-the-finish-line statement was "this was the WORST idea EVER") there's no other exercise that burns as many calories. So far, it's gone well and I'm hoping that I can actually finish the program by the time it's nice enough to be outside again. 6. I'm SO EXCITED for the newest Real World and AM NOT ASHAMED. 7. We're heading to Toronto in two weeks to visit family and friends and I CAN'T WAIT to eat all the delicious food I miss. So far on the agenda we're going to our favourite Tapas joint, Fresh for their spring rolls, sweet & savoury crepes at The Crepe Cafe and a new place that my Baby Brother says has the best burgers ever. They start out on the grill in BALLS and are then flattened into PATTIES as they cook. Sounds weird but he swears they're so delicious that you want another one after taking your FIRST bite. Look forward to that review to come! All right, so here's the part where I award other bloggers. I've given the award out to others before, so I decided that I'd CREATE MY OWN instead! Yipee!!! And GUESS WHAT? Because I made up the award, I also get to decide how it's awarded. I do love me a good dictatorship. As you can see, it's called is The I'm Over Winter But Into Your Blog Award and should be given to a blog that makes you feel as good as a warm summer's day. When it's brutal outside and you're wishing that Mother Nature had a Twitter account so you could bombard it with demands for an early Spring, you read ________'s blog to feel better. If you have a few blogs that fit the criteria, award them all! There are no recommended number of pass-ons. There are also no requirements for the recipient EXCEPT to pass along the award to others. If someone gives it to you, it means that your blog makes their dreary winter days better and that's one heck of a COMPLIMENT! I, for one, turn to four blogs in order to temporarily forget that I moved to a place where there's so much snow, we need to make pathways in the front yard so our dogs can go to the bathroom. Jennie...I just love you. Plain & simple. Thanks so much, Jennie! You're awesome. It's funny how I wanted a baby brother so bad when I was a kid and you tried to do away with yours. I'm a total wimp when it comes to scary movies, too. My babysitter made me watch Poltergeist when I was like 10 and it totally scarred me for life. I also have a mild obsession with diet coke, but since I drink coffee too, I allow myself one a day of each. Thanks again for the award. You totally made my day.